b.) I clear out the bags that I don’t use. c.) that I actually get to clear out the bags that I don’t use. d.) If I land a good deal in terms of work. (Then all conditions above do not apply). Please note that this ban only extends to bags and not wallets as I do definitely need to purchase one and I don’t purchase wallets frequently. Having said that, I am on the hunt to find a new baby bag that is big, functional, and more importantly light. When I was pregnant, I purchased the Balenciaga RTT GSH in black because it was huge and I was sure that all the baby’s stuff would fit inside (which actually does, even for long plane trips). However, it can be difficult to use as a baby bag due to the weight. Unfortunately, I have a hard time carrying the bag and the baby together for long periods at a time… I know I know… I must go back to the gym. 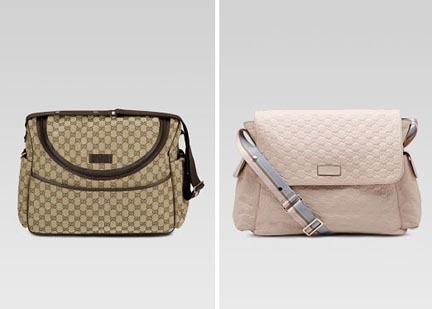 So, last Christmas I was about to purchase the gucci messenger diaper bag in either pink or beige as a Christmas gift to Gabby, but alas that Bottega caught my eye and I figured, what the heck… my little one may be happy when she gets older that I bought that bag because by then she’ll have a vintage BV. Anyway, the purpose of this post is to offer you fellow bloggers a mission. Your mission, should you accept it, is to post ideas of what you think would work as a baby bag! That depends 🙂 What do I get in return? Good point nic! Thank god, I haven’t spilled milk or left a doo doo diaper inside that baby!